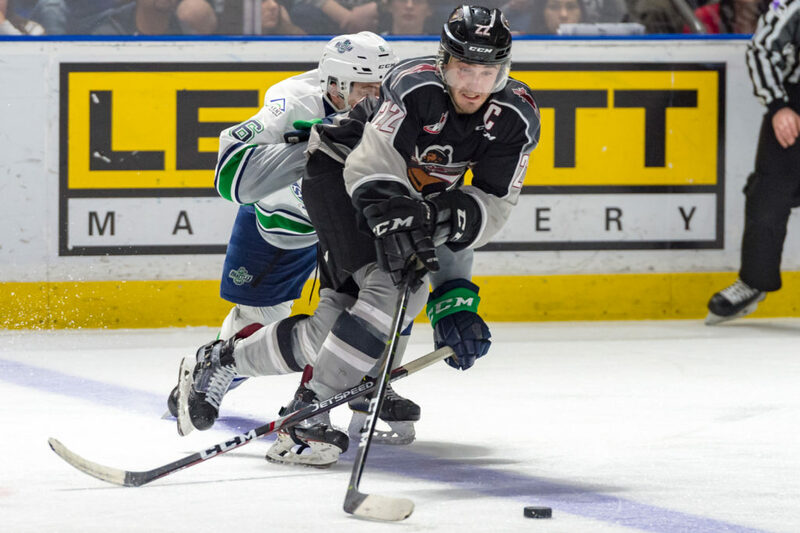 The Vancouver Giants have regained home ice advantage in their first-round series with the Seattle Thunderbirds. Tuesday night at the accesso ShoWare Center the Vancouver Giants defeated the Seattle Thunderbirds by a 6-4 score. Tristen Nielsen and Bowen Byram each finished with a goal and two assists and David Tendeck made 25 saves. The Giants finished two-for-three on the power play. Payton Mount had two goals in response for the Seattle Thunderbirds. SEA – 4:06 into the first period Seattle opened the scoring when Matthew Wedman potted his first of the playoffs when he banged home a Nolan Volcan rebound from the left-wing circle. 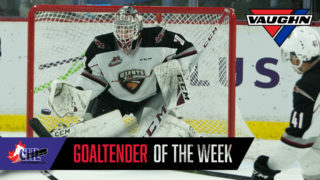 VAN – With 33 seconds left in the first period the G-Men tied the score when Tristen Nielsen (1) netted his first of the playoffs off a shot from the right-wing corner that deflected off Seattle goaltender Roddy Ross and in. Nielsen’s goal came with one second left on a power play. Lukas Svejkovsky and Owen Hardy assisted. VAN – Bowen Byram (2) gave the Giants their first lead of the night at 3:21 when he converted off a Lukas Svejkovsky rebound. Tristen Nielsen also assisted on the play. SEA – At 8:40 Seattle answered with an equalizer on a power play. David Tendeck made a point-blank save off Kelti Jeri-Leon, but Payton Mount deposited the rebound home for his first of the series. SEA – Two minutes and 29 seconds later the T-Birds took their second lead of the night thanks to another Payton Mount power play goal. This one came off a deflection off a Simon Kubicek point shot. Both power play goals were as a result of too-many-men penalties. VAN – Once again the Giants found a late period answer. This one came courtesy of Jadon Joseph who parked himself in front of the net and stuffed home his third goal in as many games. Joseph’s goal came on the power play and was assisted by both Dylan Plouffe and Bowen Byram. VAN – 24 seconds into the third period with the team’s skating four-on-four the Giants took the lead for the final time when Alex Kannok Leipert wired home his first of the playoffs. Jared Dmytriw and Bowen Byram earned assists. VAN – At 7:02 of the third, Dallas Hines gave the Giants their first two-goal lead of the game when he skated into the slot, took a Davis Koch feed and buried his first career WHL playoff goal. Tristen Nielsen drew the second assist to record his third point of the game. SEA – Seattle did not go quietly into the night. Sean Richards (2) made it a 5-4 game at 16:38 when his shot from the left-wing deflected off David Tendeck’s glove and in. 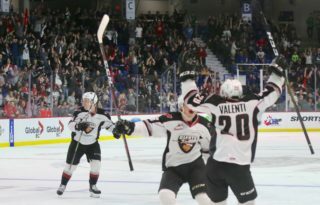 VAN – Brayden Watts (1) ended all hopes of a Seattle comeback at 19:38 when he notched his first career WHL playoff goal into the empty net to help cement the Giants 6-4 victory. Next Game: Wednesday night at 7:05 PM, Game 4 at ShoWare Center. 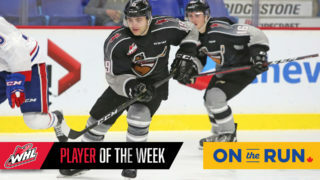 Jadon Joseph extended his playoff goal-scoring streak to three games. He now leads all Giants with three goals so far in the series, and has scored in each of his past four games going back to the regular season. The Giants power play has struck in all three games of the series. Through three games, the Giants are 5/14 on the man advantage. Alex Kannok Leipert, Brayden Watts and Dallas Hines all recorded their first career WHL playoff goals in Tuesday’s victory. 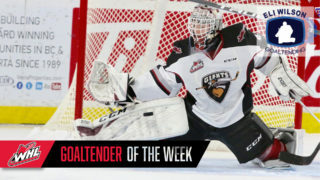 David Tendeck improved his WHL playoff record to 3-1-1 with the win on Tuesday.